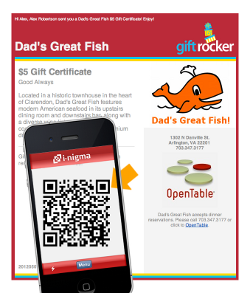 GiftRocker allows Shopkeepers to sell gift cards on their website. The online ordering pages carry your graphics and colors keeping your brand in the spotlight. Once purchased, gift cards are sent to your customers via email or text and optionally added to their iPhone or Android Passbook. Money collected during the sale is deposited via ACH into your bank account. You have a few options with how you receive your funds. With GiftRocker, Shopkeepers can also manage events, sell fixed priced items and run campaigns working with their customers online and mobile. GiftRocker’s in-store gift cards are sold via your iPhone Shopkeeper app. The GiftRocker offering is less expensive than traditional plastic cards, eco-friendly and a ton more versatile. GiftRocker offers subscription pricing. Special pricing options are available to match your specific needs if a subscription does not make sense. MULTI STORE FEATURES: GiftRocker has a number of cross store redeem and settlement options for multi store and multi concept restaurant groups. Contact us to schedule a meeting for more details.